Severe pain can have any number of causes, many of them related to the muscles and the nerves, and part of the job of any effective pain treatment center is making an accurate diagnosis on the cause of pain. Doctors, medical centers and hospitals make use of a number of different diagnostic tools when a patient is in pain like x-rays and other imaging methods. However, making sense of nerve and muscle related pain can be a much more complicated endeavor that requires a specialized touch. Diagnostic images don’t always tell the whole story. That’s why we make use of tests like the Nerve conduction velocity study (NCV) and Electromyography (EMG) at Living Well Medical in NYC. By combining these state-of-the-art tests with a wide range of pain treatment protocols, we can help patients reduce pain and enjoy a better quality of life. A nerve conduction study is a method of measuring and evaluating the function of the motor and sensory nerves in the human body. By applying an electrical stimulation and measuring the response, a specially-trained doctor can gather information about whether there is any interruption to correct nerve function. Typically, NCV’s are only performed for patients who are experiencing numbness, burning, tingling or muscle weakness. Measurements that are taken include latency which shows the time delay between the stimulus and the recording site and the amplitude which shows the size of the reaction. 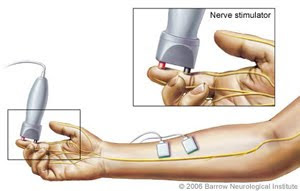 Nerve conduction velocity is often used to diagnose common conditions such as Carpal tunnel syndrome, spinal disc herniation, and other types of neuropathy (damage to the peripheral nerves). NCV studies help our NYC office make the right diagnosis the first time so that treatment can proceed smoothly. Electromyography (EMG) is a method of recording and evaluating the activation signal created by muscles in the human body. By measuring the electrical potential that is generated by muscle cells when both active and at rest, abnormalities in the muscles and nerves can be detected and diagnosed. By placing an electrode on the muscle that is believed to be the cause of pain, a doctor can observe whether muscle contractions are activating in the acceptable normal ranges. Any deviation can help diagnose nerve and muscle dysfunctions like Carpal tunnel syndrome, sciatic nerve dysfunction, spinal stenosis, and various types of myopathy (a muscular disease that results in muscle weakness). Living Well Medical in NYC has a medical doctor who is Board Certified in Pain Management on staff performing nerve conduction velocity studies (NCV) and electromyography (EMG) so that we can make the right choices in creating an effective treatment plan. Combining several non-surgical treatment options, we can help you stop the pain. This is just one aspect of Living Well that makes us special and different from your average pain treatment center. Call us at (212) 645-8151 for more information on evaluation and treatment. Cool! I don't know that it is possible to diagnose the nerve pain. My uncle have the same story. I think I need to show this post to him. Thanks for sharing this very informative post. I learned a lot.